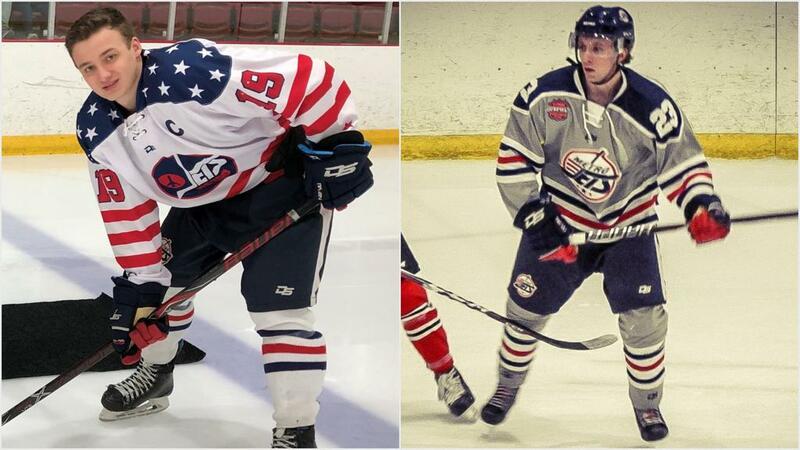 FRASER, Mich. – The college commitment train keeps rolling for the Metro Jets. Last week, Jets captain Jeremy Schwartz decided on Oakland University, while Metro forward Joey Bruce chose Grand Valley State University. Both players skated for the Jets from 2017-19 and were key cogs in the team’s national championship in 2018 and run to the national championship final in 2019. “This is another big day for players from the Jets,” said Jets coach-GM Justin Quenneville. “Both Jeremy and Joey were two-year players here and won a national championship. Joey brought a skill set that made him a versatile forward. He scored goals in bunches and capitalized on his opportunities. GVSU will be getting a talented player and great person. Jeremy was our captain this season and steered this ship on the ice. He was always counted on to play vital minutes and situations when needed. He always worked hard and was a staple Jet in the way he played the game on both sides of the puck. To be able to see him get a chance to play with his brothers will be great for everyone. “We wish both guys the best of luck." This past season, the 20-year-old Schwartz tallied 15 goals and 36 points in 42 games and added another four goals and six points in seven playoff games. In 2017-18, Schwartz posted 16 goals and 32 points in 43 games with five more goals coming in eight playoff games. “OU is a great school and has an awesome hockey team, plus it’s close to home,” the 20-year-old Warren native said. “The Jets helped get me to this point mostly taking it to the MAT every morning, but also working with ‘Q’ on the ice. Schwartz will be joined at Rochester-based OU by his two older brothers and former Jets in defenseman Cory Schwartz (2018-19) and forward Cam Schwartz (2015-17). For Bruce, a 20-year-old Wixom product, he’s elated to head west to Allendale to attend GVSU. “Grand Valley is a great school, a lot of good people there, and I really liked the campus when I visited,” said Bruce. During the 2018-19 season, Bruce scored 14 goals and 36 points in 42 games. He added a goal in seven playoff games. Last season, he registered 18 goals and 35 points in 49 regular-season and postseason games. “The Jets have helped me grow as a hockey player and as a person off the ice exponentially,” said Bruce. “I can’t begin to thank everyone in the organization enough, from (team owner) Pete Cammick, Q, (associate head coach) Jamie Lovell, (assistant coach) Randy Wilson, (assistant coach) Dan Pszenyczny, (equipment managers) Paulie Sheridan and Kenny Sidun and (director of communications) Matt Mackinder for what they have done for me. The two years that I have spent here have been the best two years of my life and I will never forget winning the national championship for as long as I live. Losing in the finals this year was tough but I’m sure that all the boys coming back will be hungry to get it back, and I wish everyone the best of luck. I will be watching. Stay tuned as more Jets’ college commitments will be announced in the spring and summer months.